July 31, 2009, Frontier Airlines a low cost airline headquartered in Denver, Colorado operates flights throughout the United States, Mexico, and Canada. The airline operates two thirds of its US destinations west of the Mississippi River. Its sole hub is located at Denver International Airport, and provides regional service to the surrounding Rocky Mountain States through a code-share agreement with Great Lakes Airlines. On April 10, 2008, Frontier announced that it had filed for Chapter 11 bankruptcy due to its credit card processor, First Data, attempting to withhold significant proceeds from ticket sales. First Data decided that it would withhold 100% of the carrier's proceeds from ticket sales beginning May 1. According to Frontier's press release, "This change in practice would have represented a material change to our cash forecasts and business plan. 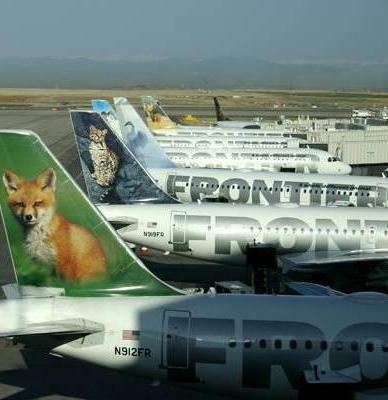 Unchecked, it would have put severe restraints on Frontier's liquidity..." Its operation continues uninterrupted, though, as Chapter 11 bankruptcy protects the corporation's assets and allows restructuring to ensure long-term viability. Frontier filed for bankruptcy court protection in April 2008. On June 22, 2009, Republic Airways submitted a bid to purchase Frontier for $108.8 million and on June 22, 2009, Frontier announced that pending court approval, Republic Airways would become corporate parent of Frontier. It is now apparent that Frontier Airlines will be sold at auction in a bankruptcy court next month, Southwest Airlines has indicated that it will bid on the carrier. Southwest Airlines has submitted a nonbinding proposal in accordance with the bidding procedures established in the U.S. Bankruptcy Court for the Southern District of New York. The bid is worth a minimum of $113.6 million, which is in excess of the bid currently filed by Republic Airways. Submission of a nonbinding proposal gives Southwest an opportunity to engage with Frontier in the due diligence required to determine the scope of a binding proposal to be submitted by the court's Aug. 10, 2009, deadline. "We are excited about the opportunity to submit a bid," said Gary Kelly, Southwest's Chairman of the Board, President, and CEO. "We see a strong fit between our Company cultures, a mutual commitment to high quality Customer Service, and similar entrepreneurial roots." A successful acquisition of Frontier Airlines will allow Southwest to expand its network with its legendary low fares, add jobs into Southwest, and boost competition in Denver and other cities. Southwest is a qualified investor and is still preparing its proposal; therefore, it is premature to comment on the specifics at this point.